Back to homework for #sketchbookskool. This lesson was a challenge for me mostly because I just couldn’t find three items to draw. I finally decided on a couple of nice large leaves from the yard. I will redo this assignment when I get home. I also don’t have my watercolors with me, so used water soluble crayons…which work, but they aren’t the same. Always sad to leave Hawaii, but I am ready to get back to Maine, my family, my Big dog and all that crazy snow! 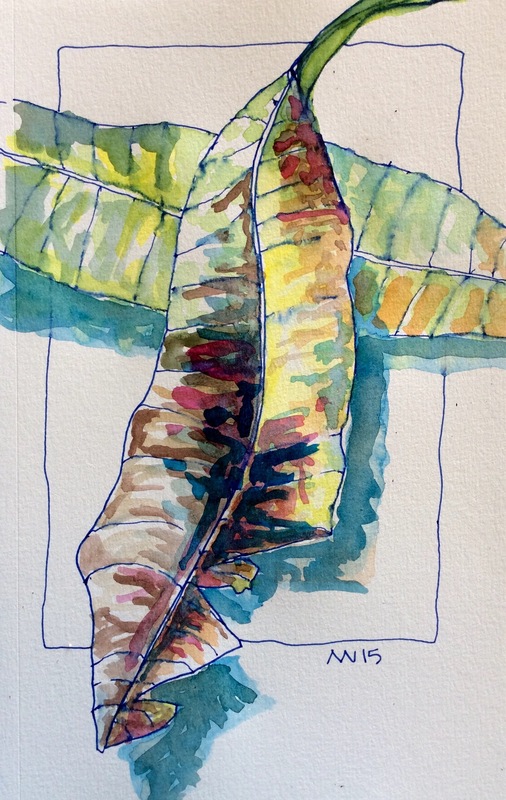 This entry was posted in #sbsseeing, #sketchbookskool, art, art journal, drawing, sketch, small painting and tagged contour drawing, leaves, pen, sketchbook skool, water soluble crayon. Bookmark the permalink. Well, I like it. I’ve never used water soluble crayon, and the pen work is lovely. I have never been to Hawaii but I have a friend who lives there. She sent me some nice Hawaiian postcards for my collection. Thanks so much. I actually really like the water soluble crayons, but they can be tricky depending on how you want to use them. Hawaii is a beautiful place, inspiration for art seemingly everywhere! But I love coming home too.